P.D James was frequently commissioned by newspapers and magazines to write a short story for Christmas, and four of the best have been drawn from the archives and published here together for the first time. 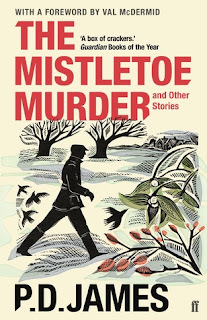 From the title story about a strained country-house Christmas party, to another about an illicit affair that ends in murder, plus two cases for detective Adam Dalgliesh, these are masterfully atmospheric stories by the acknowledged 'Queen of Crime'. This is a charming, seasonally themed array of four short stories that PD James published elsewhere between 1969 and 1996, brought together into a neat little collection, with a nice foreword from Val McDermid. For longtime James fans, two of the stories feature a younger Adam Dalgliesh, complemented by two 'standalone' stories including the most substantial, titular tale. In "The Mistletoe Murder", readers are treated to a classic-style country house murder mystery. It's Christmas and four people are staying in a stately manor. There's a murder, but the butler can't have done it, since he and his wife had been given the night off. So who did? In "A Very Commonplace Murder", a man loiters at his workplace for his own purposes, and witnesses a lovers rendezvous in a nearby building. But when he hears that a woman was murdered, he has to weigh up whether to tell the cops what he knows, and risk his own secrets coming out. The third story, "The Boxdale Inheritance", sees a young Adam Dalgliesh asked for help by his godfather, a canon (a type of priest). The man has inherited a large sum of money but worries that it might have been the result of a crime; he gets Dalgliesh to investigate past events. The final story, "The Twelve Clues of Christmas", sees a young Dalgliesh on his way to visit an aunt, only to be intercepted by a man who says there's been a suicide. But when Dalgliesh returns the man to Harkerville Hall, he begins to wonder what really happened, and if it was a suicide after all. This is a lovely little collection, the kind of read that puts a smile on your face as the pages turn. I enjoyed all the stories in different ways. James manages to pack a fair bit into quite short tales; the writing flows with a nice elegance and doesn't feel 'thin' or underdone despite the shorter length. A nice one to grab and dip into between crime novels. Tasty morsels from a master.